IREM Commercial Publications will help you expand your skill set and provide resources for every step of your career development. No matter your level of experience and expertise. 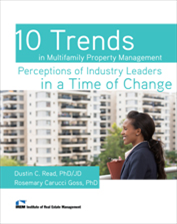 Gathered by the research team at Virginia Tech, this report explores the trends and perceptions of leaders in the multifamily housing industry, which has become increasingly competitive throughout the years. With growing demands from owners, property management companies are constantly seeking ways to maintain a competitive edge in response to the new challenges in the multifamily industry. Before and After Disaster Strikes: Developing the Emergency Procedures Manual, Fourth Edition is designed to be a guide and resource for real estate managers as they create the emergency procedures plan and develop the emergency procedures manual for the properties they manage. Designed with an all-hazards approach in mind, this fourth edition walks real estate managers through the necessary considerations when preparing for and reacting to a disaster natural or manmade. The focused chapters provide an in-depth exploration of the hazards posed to residential, commercial, industrial, and medical office properties and how they may be addressed. 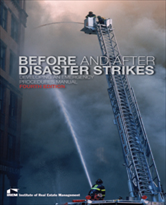 Covering more than just natural disasters, this edition provides an extensive look at how to address building emergencies from fires, power outages, or hazardous materials spills, to acts of crime and terrorism. This new edition also includes a section dedicated to exploring and implementing business continuity practices into your emergency procedures plan, demonstrating the importance of business continuity principles, while also providing concrete considerations for how to implement these practices into your business. Designed to accompany this book is a set of emergency planning forms, which were assembled by the Institute of Real Estate Management (IREM®) and its industry partners. These forms, accessible online, are provided in an effort to help establish a baseline of preparedness for any property, and may be customized or adapted to fit each application. IREM Members: Download the digital version of this for FREE! 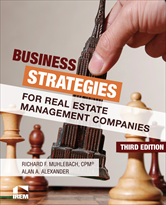 IREM developed this set of simple, practical best practices to guide and support real estate management companies committed to operating their businesses successfully and in a professional manner. The concept behind these best practices is that there are certain proven solutions and recognized guidelines that are likely to result in greater efficiency, enhanced effectiveness, and ultimately a competitive advantage. 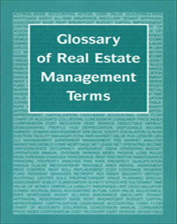 This useful glossary contains definitions for over 2,000 terms encountered in real estate management. For definitions of technical terms related to building systems, equipment maintenance, and the building trades, check out The Real Estate Manager's Technical Glossary. Investment Real Estate: Finance and Asset Management differs from other real estate investment and financial analysis publications by focusing on the real estate manager’s role to ensure that the real estate management company’s clients realize their investment goals for any given property. Real estate managers today are more than property overseers who must manage the day-to-day operations of their clients’ properties—they are often asset managers. 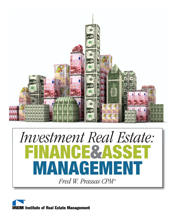 This book provides insight into the real estate management company and manager’s role in the financial analysis and asset management of a property. It also provides an inside look into the details of how to budget, forecast, and analyze cash flow. Even if some real estate managers are not actively performing the financial analysis and management of a portfolio of investment real estate, they must have a basic understanding of the impact that various decisions about a property have on the cash flow and value of a property. Today, owners have high expectations of their real estate management professionals. A strong knowledge of finance is an advantage that can enhance a real estate manager’s relationships with clients and the professionals that turn to them for their expertise. Real estate managers play a key role in preserving and enhancing the earning power of a real estate investment, and ultimately the investment’s value. Experience, knowledge, and skills that are kept up to date are critical to being competitive and respected. New! Your toolkit includes a thorough User Guide and three narrated video tutorials that walk-through how to use the major functions of the tool. Be sure to review these for all technical requirements and instructions for usage. Contains XLS Spreadsheet, PDF User Guide, and MP4 Tutorials. Ever try to run a property or company, by yourself? You probably either lead a number of teams, or are a member of one or more. Building and managing teams is one of the critical competencies required of successful real estate managers. It was ranked as one of the top leadership skills for property managers by more than 800 real estate management professionals in the IREM Job Analysis survey. Teams are more creative and productive when they can achieve high levels of participation, cooperation, and collaboration among members. But this isn’t always easy to achieve. Even if you already have highly productive teams, it doesn't mean they will stay that way. If a team gets new members, takes on new responsibilities, undergoes a company-wide reorganization, or experiences any number of other possible changes, the teambuilding process may have to start all over again. Real estate managers need to provide the direction and leadership to help teams achieve goals and operate cooperatively and cohesively. This white paper on Leadership Development: Building Teams can help you get the most out of the people you lead and the groups you manage. You are managing a property and it is not meeting the owner’s goal for annual return on investment. What do you do? Cut expenses? Spend more money on a new marketing campaign to reduce vacancies? Try to find ancillary income opportunities? If so, which ones? Hold off on capital expenditures, like replacing the leaky roof? These are questions a real estate manager constantly faces, and what they decide will determine whether they make their clients happy, or not. How do you make the right decisions? IREM’s Job Analysis lists “Critical Thinking” as one of the top five competencies required for success. Real estate managers are constantly making decisions and solving problems. They have to correctly interpret a myriad of financial data, understand market conditions, and identify operating and personnel issues. The profitability of a real estate management company, and the properties it manages, depends on skillful analysis and action. Work collaboratively with others in finding solutions to complex problems. The IREM Leadership White Paper on Critical Thinking includes development tactics that you can start implementing immediately to achieve better, more productive results in your problem solving and decision making. As a real estate manager, you must constantly negotiate new management agreements with clients, leases with tenants/residents, and contracts with vendors/suppliers. This leadership white paper provides insight into the best practices for getting the most you can out of a negotiated agreement. Learn ways to tackle the fear generated by having to negotiate something, and discover ways to best achieve your goals. Discover and follow the four key principles when conducting a negotiation, as described in Getting to Yes: Negotiating Agreement Without Giving In (2011). It’s important to understand that fear of negotiating comes from a feeling that we might not be very good at negotiating and might end up with less than what we want or need. If both parties of a negotiation view it as a “win-lose” situation, both parties are likely to lose—or at least, not “win” as much as they could. 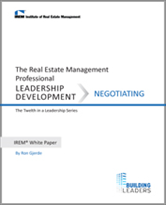 The IREM White Paperon Leadership Development: Negotiation explains the most efficient ways to create as much value as possible for all the parties by looking for “win-win” solutions. What leadership competencies does a property manager need for success? Did you know that there’s a difference between a leader and a manager? This IREM White Paper identifies sixteen leadership competencies a real estate manager needs to survive in the new economy. Derived from the IREM Job analysis, the leadership skills are based on a survey of more than 800 top real estate management professionals. Today’s economy is forcing real estate companies to shift their focus from being performance-driven to relationship-driven. This White Paper focuses on how leadership development can help real estate managers move up the career ladder. The higher real estate managers move up that ladder, the more they will have to manage people and relationships, rather than systems and tasks. For real estate professionals this means less time will be spent actually managing properties—instead, their time will be leading the people who manage properties. This White Paper also emphasizes the four basic components to help real estate managers assess their level of emotional intelligence (EQ), helpful tips on what it takes to be a good leader, and how to get started on the leadership development journey.